We were shocked for a moment and then Rudi returned her smile and said, “thank you for your service,” – something he said to a veteran at Book Passage who said he had served in World War II. With Fred Rosenbaum, Mira Shelub wrote about her experience in Never the Last Road. A Partisan’s Life. 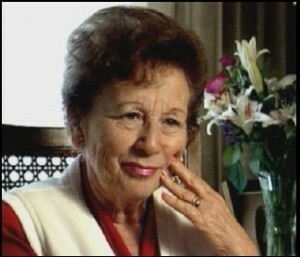 Mira grew up in Zhetel, a small Polish town which was largely Jewish. She had an extended family in this town and others nearby. Some residents were Zionists, others were Communists, Stalinists and some strived to assimilate. She had a happy childhood with an excellent education that would allow her to go to an excellent school in a larger city. With the German Invasion of the Soviet Union, life changed drastically. Mira describes how 1500 Jews from her town, including her grandfather, were marched into the forest. Shortly thereafter they heard the gun shots of the mass executions. Soon Mira, her parents, brother and her sister were forced into a labor camp where they had to build a bridge and an airfield. For the stones they had to use the headstones of the Jewish cemetery. One day a young man jumped over the fence into the camp. He told Mira that he belonged to a group of Soviet and Jewish partisans in the forest. They had in vain searched for doctors to join them but now they are just looking for new members. He invited Mira to come along. With the approval of her parents, Mira and her sister fled with the young man and from that moment, they began to fight back against the Nazis. She lived under unimaginable deprivations and constant danger until liberation by the advancing Soviets. In her page-turner of a book, Mira Shelub details her life in the Stetl and in the cold forest facing death and freezing, hunger and devastation. She lost her home, most of her friends and family but she decided to fight back and kept her dignity. “Fighting back for the next two years shaped my character and the rest of my life. Never since, have I stood by passively in a crisis,” she says. Although Stumbling Stone is a novel, it is based on our true life stories – and the story of Rudi’s Uncle Gerhard. As far as we know, he wasn’t in the Resistance. He wasn’t a Partisan. But he did resist and when we researched his story and we wrote about him, we wondered what we would have done, growing up in Nazi Germany as a rebellious teen-ager. How many of us would have done what Mira Shelub – or Gerhard Raab – did?